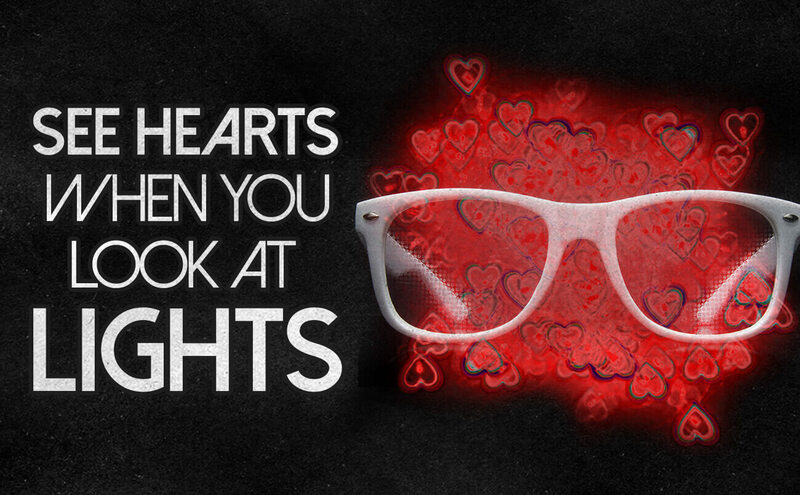 See Hearts When You Look at Lights! 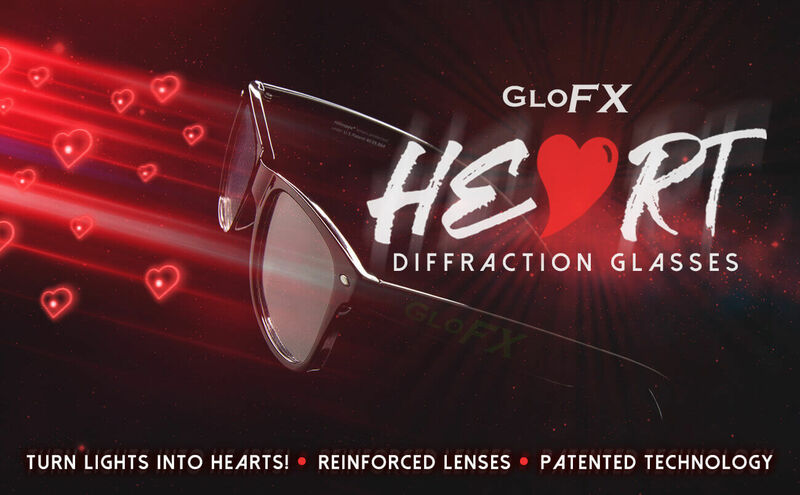 Everything becomes the apple of your eye when you look through GloFX Heart Effect Diffraction Glasses! You are going to absolutely adore the effect of these one-of-a-kind rainbow prism lenses. These glasses are the perfect addition to any event, whether it be an EDM festival, a rave, or just a regular old party. 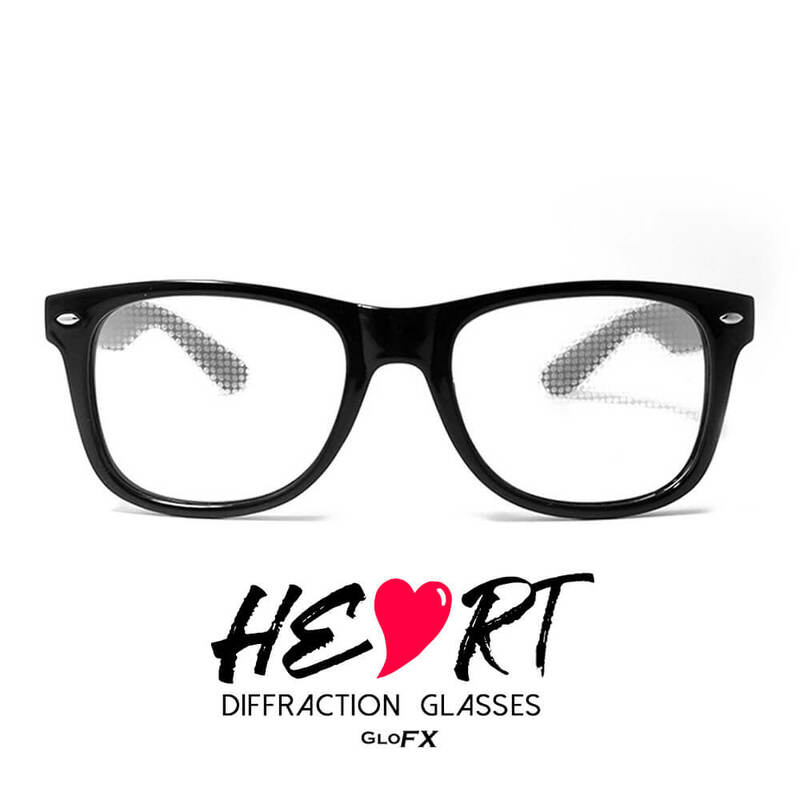 Fall in love with diffraction all over again with the absolutely fetching GloFX Heart Effect Diffraction Glasses! The Patented Lens Technology used in our glasses produces remarkable clarity and clear shapes. 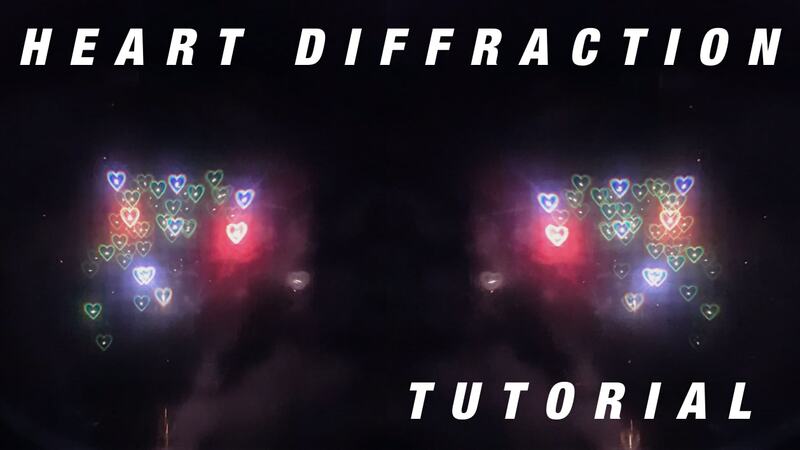 The unique 3D heart shaped diffraction effect is only evident when you are looking head on at a point of light. When you are standing in front of the main-stage of your next major EDM festival, these glasses will make the lights explode into rainbow hearts! The heart effect featured in these shades is only available from GloFX, you can’t get these anywhere else! 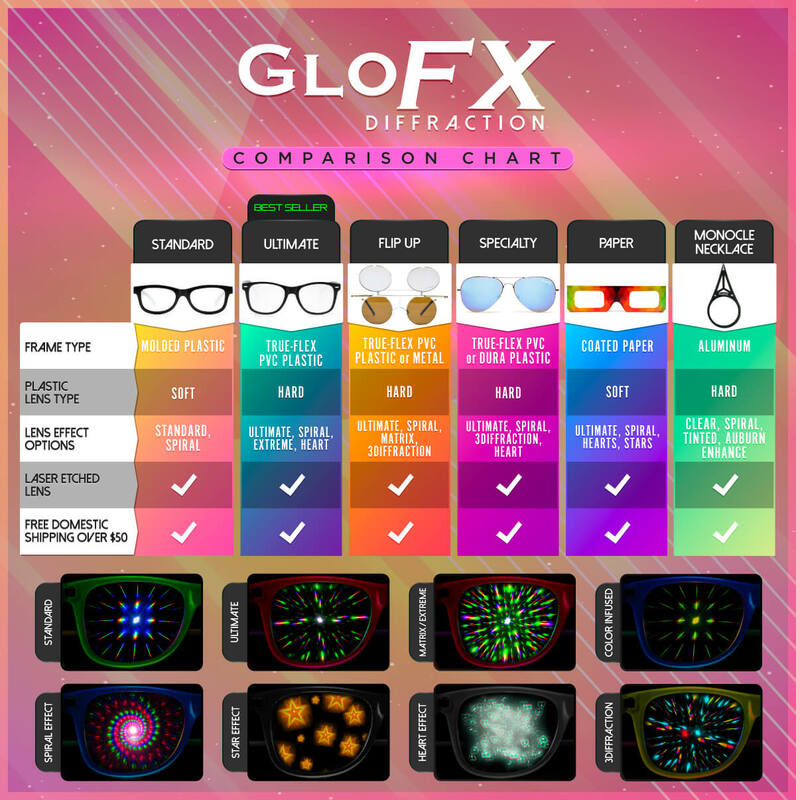 GloFX Heart Effect Diffraction Glasses are water resistant, feature stainless steel hinges, and the True-Flex Plastic Frame is virtually indestructible. 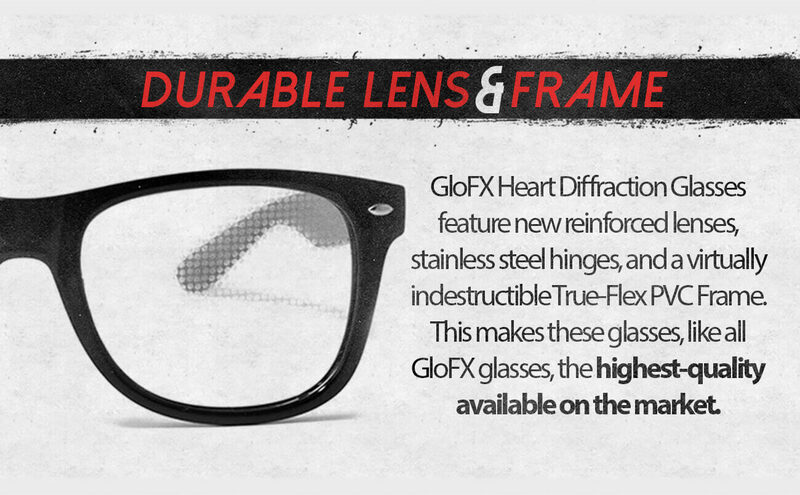 This makes these glasses, like all GloFX frames, the highest-quality available on the market. There is no reason you should settle for less! This product is proudly MADE IN THE USA and backed with a lifetime warranty. 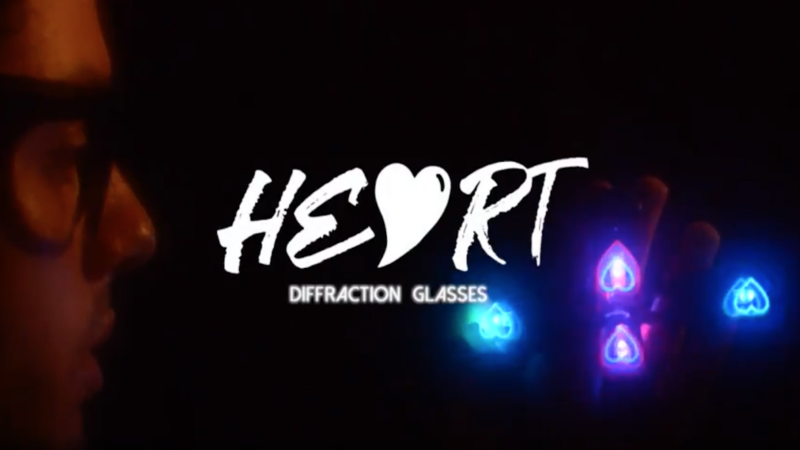 IMPORTANT NOTE: Heart Effect Diffraction Glasses do not diffract indirect light. To see hearts, you must view a direct light source. Just got these in the mail today!!! The hearts are so cute when you look at lights 🙂 I cant wait to try them at Freaknight on halloween!!! <3 thank you!! Seeing all the hearts was amazing these are by far my favorite pair from glofx. They bring good vibes and you can entertain yourself almost anywhere, I used them at countdown and even around my house during christmas time. It was so cool the only con is that the lenses pop out extremely easily 🙁 I lost the lenses because they popped out in my bag and were never found. I am really considering buying a new pair because they were so fun to use but I just don’t want the same thing to happen to me again. I absolutely love my pair! They don’t distort things TOO much so I can wear them for a while, but they make everything look like it’s surrounded by hearts. Gave me some great loving vibes. These have quickly become my favorite diffraction glasses. Got these in the mail just in time for Nocturnal and I loved them!! My favorite part was sharing them with people and watching their faces light up when they saw the hearts!! The effect was not overwhelming either so i could wear them for longer than most glasses/ still get around the festival while wearing them. They looked so dope when looking at fire effects on stages! I wish the lenses were a little sturdier as they are soft plastic and tend to pop out but overall I loved this purchase! These were amazing! Such a big hit with everyone I share them with! I would give 5 stars but the first pair I bought one of the lenses fell out and the same thing happened with the second pair I bought.